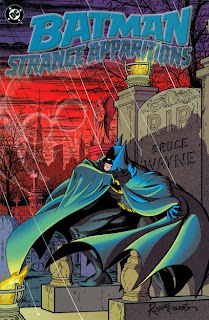 The best thing that I can say about Batman: Strange Apparitions is that it's iconic in many senses of the word. The worst thing I can say for it is that the whole is greater than the sum of its collected parts. If you asked one hundred Bat-fans to list the creators who most "understood" Batman in their work, a great number would mention Englehart and Rogers; they probably wouldn't lead the pack due to more high-profile work by Frank Miller, Jeph Loeb, and Grant Morrison, but Englehart and Rogers recontextualized Batman for a new generation of readers. Eschewing the kitschy 1950s and the campy '60s styles, the 1977-78 run reintroduces Batman as a detective first, with a sharp intellect and an irresistible allure that women can't resist (unfortunately for Bat-purists, his romantic scenes have nary a Neal-Adams-hairy-love-god-chest in sight). Englehart and Rogers have practically been canonized by comics fans for "saving" Batman from what he had become. I think, though, it's time to reevaluate the position of Strange Apparitions in the Bat-library. No, I'm not out to try to pin it down continuity-wise; that's a feat I'll leave to the readers, if they so desire (but I think it's "in" since Hugo Strange's unmasking of Batman got a reference in Arkham Reborn). As a movement, the Englehart/Rogers dynamic duo is undeniably important, with a moody overtone and genius-level detective at the forefront; as a collection, Strange Apparitions reads as incredibly uneven, with formulaic plots punctuated by moments of high characterization and inventive storytelling. It's almost as though the collection were written by two different people -- oh, wait, it was. Bafflingly, Strange Apparitions is marketed on the backs of Englehart and Rogers, yet they're only together for six of the eleven issues collected; we also get two issues written by Len Wein (with Rogers illustrating) and three issues illustrated by Walt Simonson (with Englehart writing). Structurally, this is a little jarring. The Englehart/Simonson issues are essential to the narrative, but Simonson's pencils and paneling lack the polish that Rogers would bring; conversely, Wein's Clayface issues have nothing to do with the overarching storyline (except for ephemeral references to Silver St. Cloud) and seem like a less successful version of Alan Moore's work with the same character, but Rogers's work is fine and pristine. The highlight of the collection, of course, is the six-issue run of Detective Comics that paired Englehart with Rogers. Long-time Bat-fans unfamiliar with Strange Apparitions will be surprised how much of it feels familiar, since it's been appropriated by other Batman titles left and right; Hugo Strange's unmasking and subsequent auctioning of Batman's identity, the presence of Rupert Thorne as Gotham's resident crime boss, and the infamous "laughing fish" Joker caper were all translated (sometimes verbatim) into the fantastic Batman: The Animated Series, and the "laughing fish" stories have been collected every time the Joker's name is invoked. These are the greatest moments in the collection; these stories read quickly and delectably, with Englehart's breakneck pacing challenged only by the absolutely gorgeous artwork by Rogers that demands you linger over the panels even as the narrative demands you move forward. But I came to Strange Apparitions expecting eleven issues of legendary greatness, and I just didn't get it. Aside from the issues that pair Englehart and Rogers with other creators, there are two other issues that just don't feel right. In separate issues featuring the Penguin and Deadshot, Englehart and Rogers both feel like they're phoning it in; the stories are more Batman '66 than Batman '89 with an emphasis on elaborate schemes and stagey fight scenes atop gigantic typewriters. These stories are so hit-and-miss that it's difficult to believe that it's the same team throughout the middle of the collection. The only strength of these two issues is that Englehart seems to know that the main plotline is ultimately a one-and-done, so he sprinkles in tantalizing clues toward the larger story arc at work; the ghost of Hugo Strange stalks his murderer, and the Joker lurks ominously in the shadows, laughing maniacally but ultimately unseen. Perhaps it is precisely these moments that make the better issues in the collection a success. The Joker's appearance in "The Laughing Fish" has been teased throughout Englehart's preceding seven issues, such that his grand appearance in the copyright commissioner's office can't help but feel epic (and the iconic full-length panel filed with "HAHAHAs" doesn't hurt, either). The collection itself is bookended by a kind of filler, but the meat of the collection is itself bookended -- this time by the two best and brightest Englehart/Rogers stories (featuring Hugo Strange and the Joker). For these two stories alone, Strange Apparitions is worth the price of admission, because when the book is closed that's what the reader takes away: the high caliber of artistry displayed in those four chapters. That's why I say that Strange Apparitions is not a perfect collection -- because there are only a few stories in it that are as delightful as advertised. But despite a few low-quality chapters, for a few shining moments Strange Apparitions touches that Platonic ideal of what a Batman comic book should be. A lot of collections don't include full covers, a few coming off the top of my mind being THE DEATH OF SUPERMAN, 52, WORLD WITHOUT A SUPERMAN, JLA: AMERICAN DREAMS,BATMAN:CONTAGION to name a few. Plus there are a lot with NO covers like RETURN OF SUPERMAN, BATMAN: KNIGHTFALL and I'm sure there will be a lot more. Non glossy paper loses it's sheen soon, but somehow I prefer non glossy paper to standard glossy paper simply due to the feel of the paper being more akin to the originals. Due to the classic nature of the content, I feel a reprint is necessary. I consider a select few pre COIE BATMAN stories as canon, examples include TALES OF THE DEMON, SON OF THE DEMON,BIRTH OF THE DEMON, WHERE WERE YOU THE NIGHT BATMAN WAS KILLED?, the stories featuring THE SPOOK, SCARECROW & TWO FACE from the 70s in addition to the offerings by ENGLEHART/ROGERS. Another classic by ROGERS though plotted by the late & great ARCHIE GOODWIN is a 5 part story called SIEGE. It was scripted by James Robinson I think but not sure. Another great ROGERS story is GREEN LANTERN: EVIL'S MIGHT, a 3 part ELSEWORLDS story. I disagree slightly about the Penguin and Deadshot issues. Both arguably are formulaic but I think they have to be considered in the context of the time in which they were published. Deadshot in particular at the time had none of the sophistication that Ostrander would bring to the character later - he was far more a cartoonish supervillain. Far from phoning it in, I saw those two issues as a pretty effective attempt by Englehart and Rogers to update two older villains and tell stories about them in a (then) modern setting while keeping some of the classic trappings (like the giant set pieces and props). It's a nice mix of the darker O'Neil/ Adams Batman with the lighter 50's/60's interpretation. Agreed about the Wein issues, though - they're pretty grossly overwritten and really don't belong alongside the Englehart issues. @Joshi - you are correct about "Siege" - Robinson scripted over Goodwin's plot. I'm surprised that one's never been reprinted - I found it a far better sequel to the "Strange Apparitions" run than any of the other attempts (including "Dark Detective"), other than maybe Gerry Conway's early 80's Batman/ Detective story. You may be right about things being formulaic, but damn if I don't remember that giant typewriter sequence whenever I think about this book. There's a Batman by Marshall Rogers collection due in hardcover. I hope it collects the non Rogers issues by Englehart. What it'd collect otherwise I don't know but I'm happy the core stories with DARK DETECTIVE & SIEGE will make it. Any word if these stories will get a reprint?